Recent acceleration of the world events with the liberation of the city of Abu Kamal, followed by its sudden recapture by the Islamic State militants is showing us, that if we want to see our civilization enter the golden era of a true global peace, we must not waver and need to continue manifesting our dreams, intentions and wishes of a peaceful world, until they become our reality. 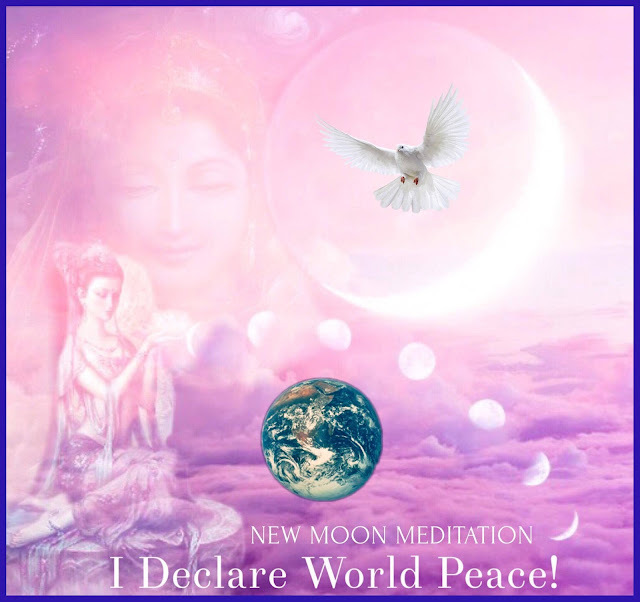 To bring about this ultimate goal we will do the Peace Meditation at each New Moon at 2:30 pm UTC. New Moon is the time when we set up our intentions, plant seeds, which we want to come to fruition at the time of the Full Moon. Let’s engage in bringing the ultimate sustainable world Peace without anymore devastating war to the planet! It is an energetic doorway that allows us to break ground for new cycles from within, a time for spiritual and emotional reboot. This Scorpio New Moon comes with a commanding, uncompromising air of forcefulness, urging us to tap into our innate raw, alchemical power, asking us to take the lead that weighs us down and turn it into shimmering, glorious gold. 2. State your intent and decision for World Peace to become an ultimate reality on this planet. 3. Visualize a pillar of brilliant white Light emanating from the Galactic Central Sun, then going through all beings of Light inside our Solar System and then through your body to the center of the Earth. Visualize another pillar of Light rising from the center of the Earth, then up through your body and upwards into the sky, towards all beings of Light in our Solar System and our galaxy. You are now sitting in two pillars of Light with the Light flowing both upwards and downwards simultaneously. Keep these pillars of Light active for a few minutes and call upon the presence and assistance of all beings of Light inside these two pillars of Light. 4. Visualize Global Peace being established on the planet, a state without any war and conflict. Visualize the core of the cabal members being taken into custody and brought to justice. Visualize the World Peace Declaration being delivered to the United Nations, with all countries on a worldwide scale partaken in signing it for the first time in human history. See the people of Gaia celebrating the end of all wars and all conflicts. 5. Visualize Sisterhood of the Rose physical groups being formed throughout the planet, meditating and anchoring the energy of the Goddess, showing and inspiring people how to live in harmony, peace, acceptance, compassion and love. 6. Visualize Light workers and Light warriors gathering and activating Goddess vortices on the physical areas all over the planet. Hi, can you clarify which link needs to be corrected? Do you mean the link in the post above?